Treasures are shining and lighting the road to travel through the history of Tosa in the dark and quite space. Men and women of all age, their eyes glued to the exhibits. “Wow…It was a 100 years ago!” an old woman says as they look at long Chronological table of Tosa history studiously. “Uh-uh, I see,” an old man exclaims, his arms folded while turning his eyes to the details of all historical materials. 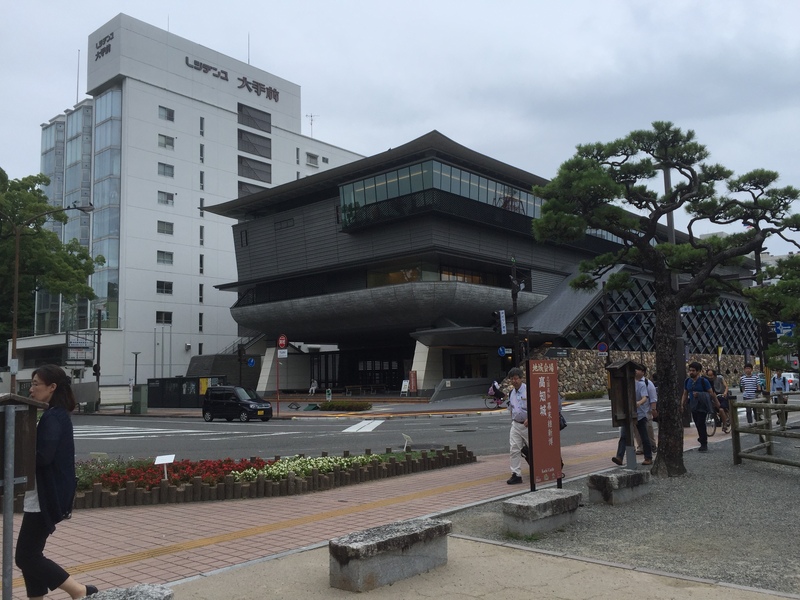 In the crowded center of Kochi city, sits the Kochi Castle Museum of History which opened March 4, 2017. This museum contains many historical materials such as yoroi (“armor”) and makimono (“scrolls”) that speak to visitors about Kochi’s history. The number of visitors reached 100,000 in the opening 4 months. This museum is filled with surprise and impression gives visitors amazement and emotion every day. However, this museum costs about 5.8 billion and took a lot of time to build this museum. Although it costs a lot of money and took a lot of time, there was a reason to start this project. Most historical materials which are preserved in this museum are from the Yamauchi Family. Actually, before this museum was built, these materials were preserved in the Tosa Yamauchi Family Treasury and Archives. However, that building was getting so old and the storage environment needed to be upgraded. In this situation, it was very hard to keep protecting the valuable materials. To solve these problem, Kochi Castle Museum of History was built, and about 67,000 items were transferred from Tosa Yamauchi Family Treasury and Archives. “I wanted to move these materials to a safe environment. I feel relieved to have done it” said Jun Watanabe, former director of the Tosa Yamauchi Family Treasury and Archives and current director of the Kochi Castle Museum of History. “I want this museum to be available for locals.” It’s very important, but it’s very hard to preserve valuable historical materials for the future generations. Even so, this museum has been researching materials and keeping it because local history and culture are essential to the local quality of life. Historical materials are “treasures” of the people. Kochi Castle Museum of History was made from valuable materials and many people’s wishes. At the foot of Kochi castle, a new cultural exchange begins with this museum as the past begins to speak to the present. I hope I can have an opportunity to visit this museum and learn about Kochi more. Sounds great! Your article gave me an anther perspective to see this museum. Thanks !! Kochi castle museum of history will influenced my life, but it interests me to catch the difference and relationship between my prefecture and Kochi. We can say modern Japan started from Kochi due to the collapse of Edo era. It would be an opportunity to know how Kochi changed over times. Your article attracted my interest to the history of Kochi! I learned that there was a long and hard process to build this museum. Great article! I want to go there someday and learn Kochi’s history.